When you consider texture in drinks that often only extends to the viscosity of the drink as a whole, often in relation to dilution or the desired impact of the flavours. The light astringency of citrus or other acids is great for palate cleansing aperitif style drinks, and the rich tongue-coating effect of chilled gin or vodka is somehow syrup-like and refreshing at the same time. We use foams all the time in sours and fizzes with egg white, but I want to go a step further, and make that layer of foam a separate flavour. 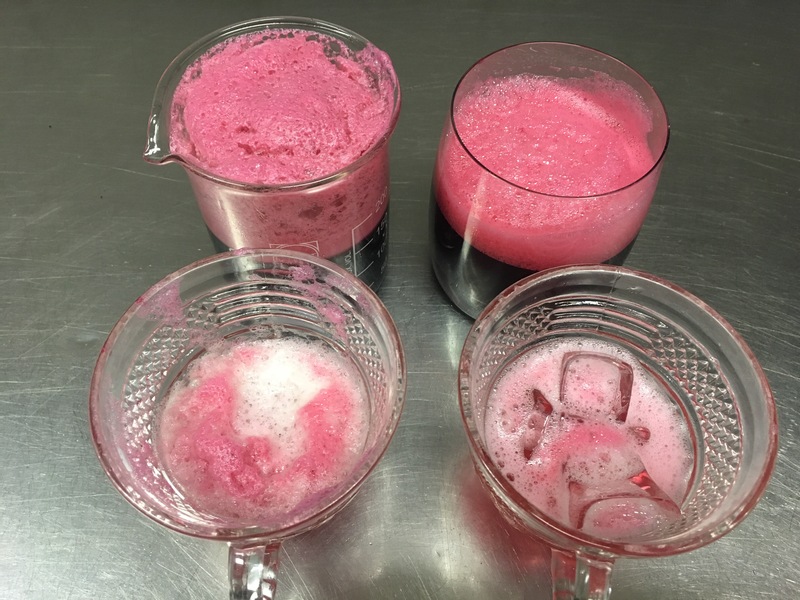 I’d seen chefs using coarse foams on dishes, and the last few iterations of the menu at work have included a drink or two topped with a dense, egg white based, flavoured mousse. Recently, talking with my workmate, Jimmy, we were pondering how to incorporate the sweet distinctive flavour of cola into a cocktail without it immediately dominating the drink. He suggested a flavoured foam, of the style we already used (the dense, egg white based mousse), and it got me thinking about the huge volumes of effervescent fluff you create when you first open and pour a room temperature bottle of carbonated soft drink. It’s even better if you’re pouring the room temperature drink over ice. The fast temperature change must shock it into foaming up even more. In my experience Diet Coke is best/worst for it. (Waiting for your mixer to settle when it’s busy is the worst.) So. what if the foam was actually that light, aerated froth rather than something dense and almost creamy, and how was I going to get it to keep its form for longer than a few minutes? Peering over shoulders in kitchens had informed me that the creation of a flavoured, beer-head style froth was a pretty common technique, so I turned my research to culinary foams, which has been enlightening. There are wet foams and dry foams, coarse foams and airs with large bubbles, and dense mousses with tightly beaded and bonded bubbles. I even learnt that bread is a “set foam”, which actually makes a lot of sense coz when you look at slice of bread its whole structure is a network of bubbles. I’ve seen Lecithin powder amongst the modern ingredients of the top shelf in the kitchen, so tomorrow, armed with the very handy digital scales, I’m going to attempt a flavoured, (and coloured), coarse foam/air. -Soy Lecithin is a commonly used stabiliser and emulsifier, which can be used to replace the lecithin that naturally occurs in things like egg yolk. -The liquid I’m trying to foam will need to be very strong, because I’m going to be diluting it so much with air. -I should be trying to add by weight at a volume of 0.3%-1% of the total liquid, depending on what I’m trying to foam. A recipe for a citrus foam that I’ve found uses something close to 0.6% of total volume, but I was planning on my foam being made from a starting liquid that was a little denser, so I’m not sure how that will impact it yet. -I need to mix the foam in a low flat container with something like a stick blender, to allow as much air interaction and incorporation as possible.